Paul Voelker doesn’t get to vote for the Mr. Hockey award winner. That doesn’t mean Voelker, a Wayzata senior, is precluded from having an opinion. 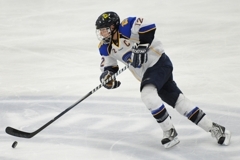 “Tony, definitely Tony,” Voelker said when asked who he would choose to win the state’s most prestigious hockey award this season. 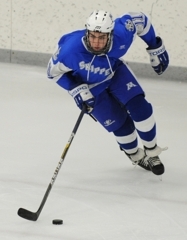 Tony would be Tony Cameranesi, the Trojans’ senior speed merchant who has committed to playing at the University of Minnesota-Duluth. 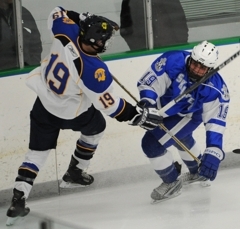 Cameranesi set up a goal with his hustle, speed and muscle during Wayzata’s 4-2 triumph over Minnetonka on Thursday, Feb. 17, at the Plymouth Ice Center. It was Voelker, though, who looked Cameranesi-like with his effort against the Skippers. Voelker had a goal and an assist as part of a high-charged line that also included Sam Majka and Bryan Tabery. “We’re really clicking right now, and hopefully we can keep it going through the playoffs,” said Voelker, who has scored five goals and added 10 assists this season. Six of Voelker’s points have come in his last five games. In an attempt to manufacture some balanced scoring, Wayzata coach Carl Davis has tweaked and tuned his lines. The combination of Voelker, Majka and Tabery clicked from the start. "At the beginning of the year it was basically just the first line doing all the scoring," Voelker said about the unit of Cameranesi, Mario Lucia and Tyler Klein, the Trojans' top three scorers. "They scored every single goal basically in every game. "Coach starting mixing up the lines and everything and he kind of emphasized that everyone needs to start contributing for us to go further." Majka has three goals in his last five games, and Tabery has a goal and two assists during that span. That sort of consistent scoring has arrived at precisely the proper moment for the No. 3-ranked Trojans (17-5-2), who are joined by No. 2 Eden Prairie, No. 4 Benilde-St. Margaret's and No. 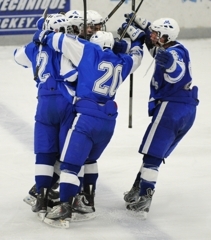 7 Minnetonka in the state’s toughest section (6AA). Voelker scored the game-clinching goal late in the third period. 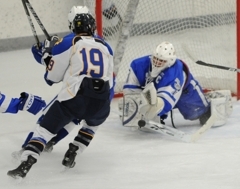 He blasted a rebound past Minnetonka goaltender Alex Glockner to put the Trojans ahead 4-2 with 2:30 remaining. Voelker raced over to the glass near the Minnetonka cheering section after scoring his goal and raised a finger to his mouth as if to say – shhhhhhhh. “I got caught up in the moment,” Voelker said about his celebration. 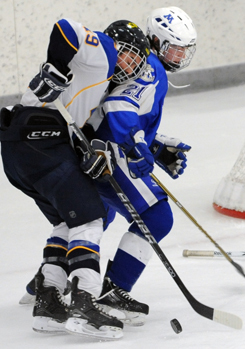 Voelker, a senior forward, dashed any hope of a Minnetonka comeback with his goal late in the third period. His post-goal celebration along the glass near the Skippers’ cheering section – a European soccer-style shhhhhhhhhhhh gesture telling the Minnetonka fans to keep quiet – scored points for its originality and execution. Voelker also had an assist on linemate Sam Majka’s second-period goal. Cameranesi, a senior Mr. Hockey finalist, had an assist when he did all the gruntwork -- digging the puck out of the corner and firing a shot on goal -- on Mario Lucia’s second-period goal. 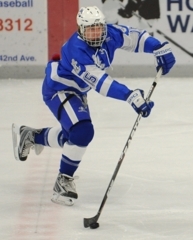 Cameranesi used his blurring speed to repeatedly beat Minnetonka defensemen and set up scoring plays. The senior goaltender was especially sharp in the first period, when his play allowed the Skippers to sneak out of the period with a 1-0 lead despite being outshot 13-3. 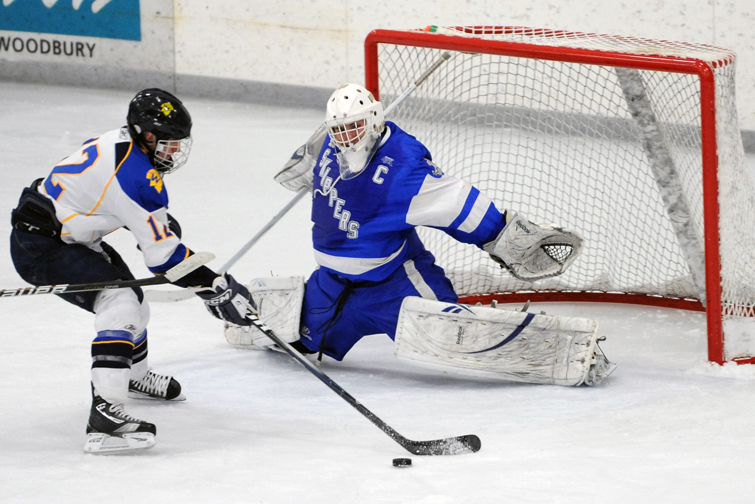 Glockner had trouble controlling a few rebounds in the second period when Wayzata took the lead, but he faced a barrage of shots and did a masterful job with most of them. 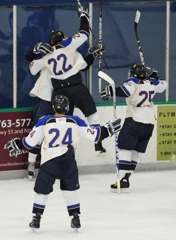 Wayzata scored three unanswered goals in the third period as it rallied from a one-goal deficit and eased past Minnetonka 4-2 on Thursday, Feb. 17, in a Lake Conference matchup featuring top 10-ranked teams at Plymouth Ice Arena in Plymouth. Juniors Mario Lucia and senior Sam Majka scored 44 seconds apart early in the second period as the No. 3-ranked Trojans (16-5-2) seized control. 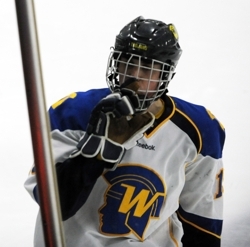 Senior Tyler Klein scored with 5:05 left in the second to put Wayzata ahead 3-1. 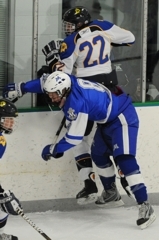 Minnetonka sophomore Jimmy Schuldt grabbed a loose puck in the high slot and ripped a wrist shot past Wayzata sophomore goaltender Aaron Dingman to pull the No. 7-ranked Skippers (15-6-2) to within 3-2 late in the third period. 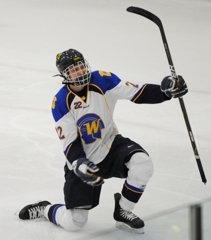 Wayzata senior Paul Voelker took the drama out of the finish when he scored with 2:30 left, rocketing a rebound into a partially open net. Voelker, Majka, Klein and Lucia each had a goal and an assist for the Trojans. 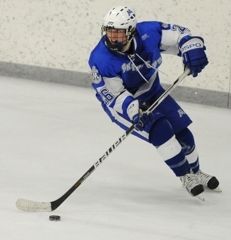 Minnetonka senior Michael Helmer scored the only goal of the first period. 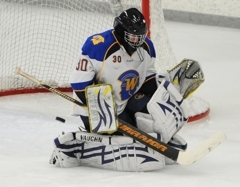 Skippers goaltender Alex Glockner stopped 31 of 35 shots while Wayzata’s Aaron Dingmann made 16 saves on 18 shots. 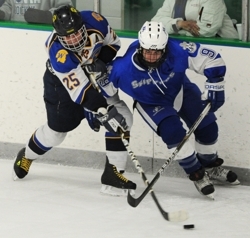 The Trojans' win avenged a 6-0 loss to the Skippers in the teams' Jan. 29 meeting in Minnetonka.